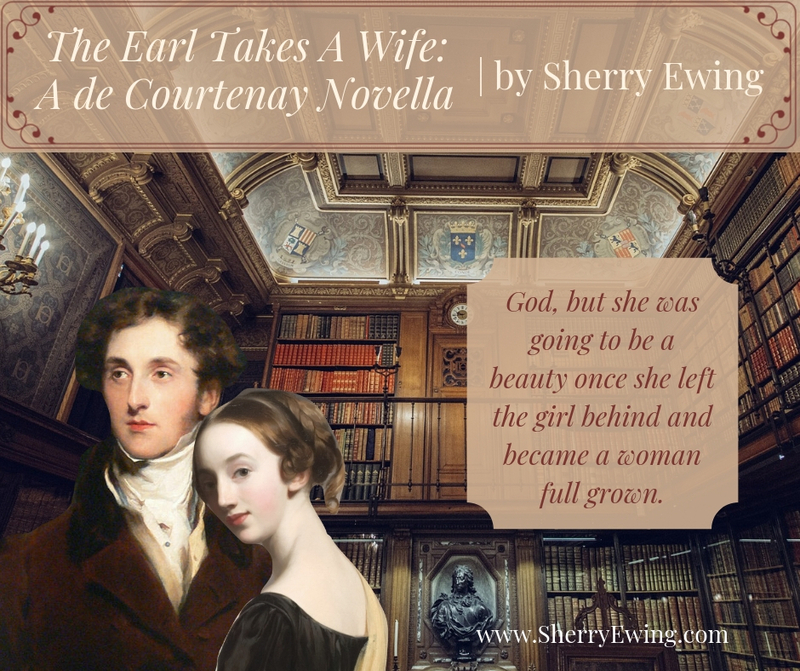 Fall back into time with Sherry Ewing’s books! 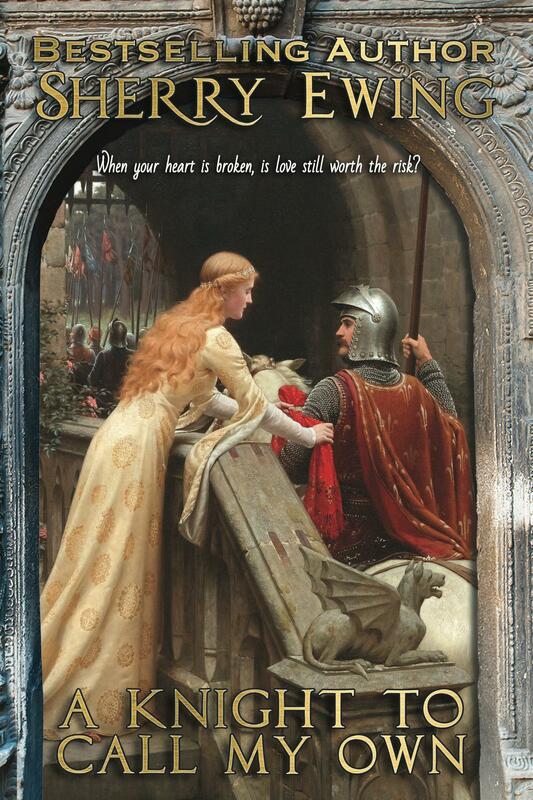 If My Heart Could See You: The MacLarens, A Medieval Romance ~ When you’re enemies, does love have a fighting chance? For Amiria of Berwyck, defeat does not come easily as she watches her home and clan being ripped asunder. When the very enemy who has laid siege to her home demands her fealty, she will do whatever it takes to protect her people including a hastily concocted ruse that quickly begins to unravel. Bestselling author Sherry Ewing presents this special edition box set combining Katherine and Riorden’s complete story from For All of Ever and Only For You in Hearts Across Time: The Knights of Berwyck, A Quest Through Time Novel (Books One & Two). 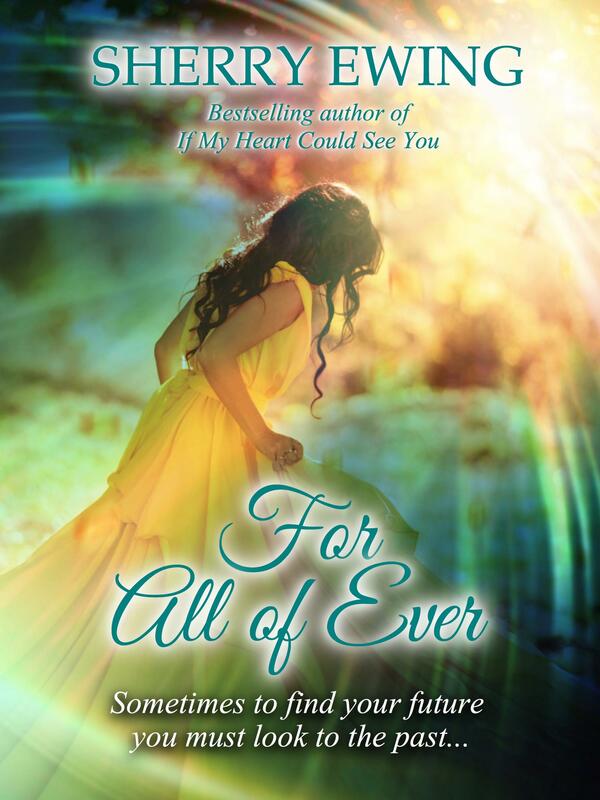 For All of Ever: Katherine Wakefield has dreamed and written of her knight in shining armor all her life until she and her three closest friends take a vacation to England. Yet, how could they have known they’d find themselves thrown back more than eight hundred years into the past? Riorden de Deveraux travels to Bamburgh answering the summons of King Henry. But nothing prepares him for the beautiful vision of a strangely clad ghost who first appears in his chamber. Centuries are keeping them apart until Time gives them a chance at finding love. Will the past of one consume what their future may hold, or will Time take the decision from them and hurdle Katherine forward to where she truly belongs? 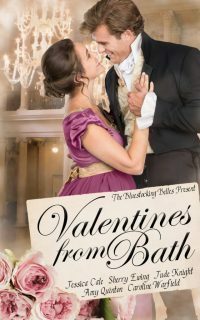 Only For You: Katherine de Deveraux has it all but settling into her duties at Warkworth Castle is not easy & downright dangerous to her well-being. Consumed with memories of his father, Riorden must deal with his sire’s widow. Yet how could he know how far Marguerite will go to have the life she feels they were meant to live? Torn apart, Time becomes their true enemy while Marguerite continues her ploy to keep Riorden at her side. 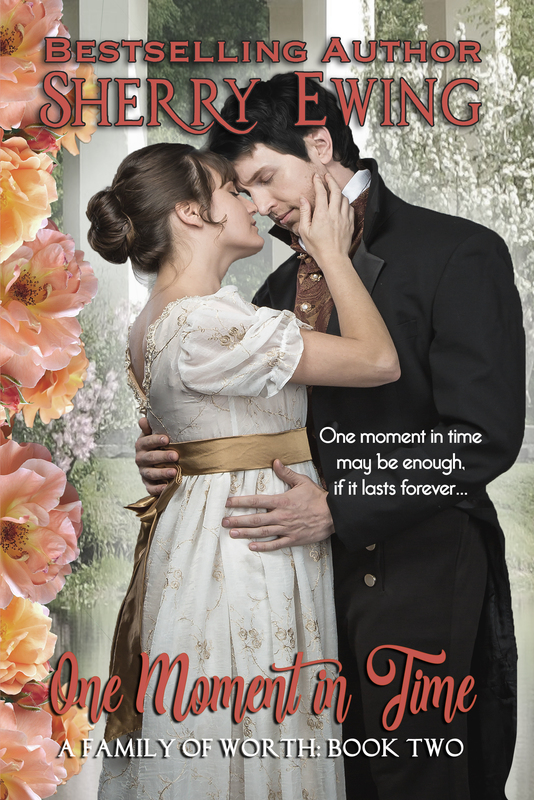 With all hope lost, will Katherine & Riorden find a way to save their marriage? 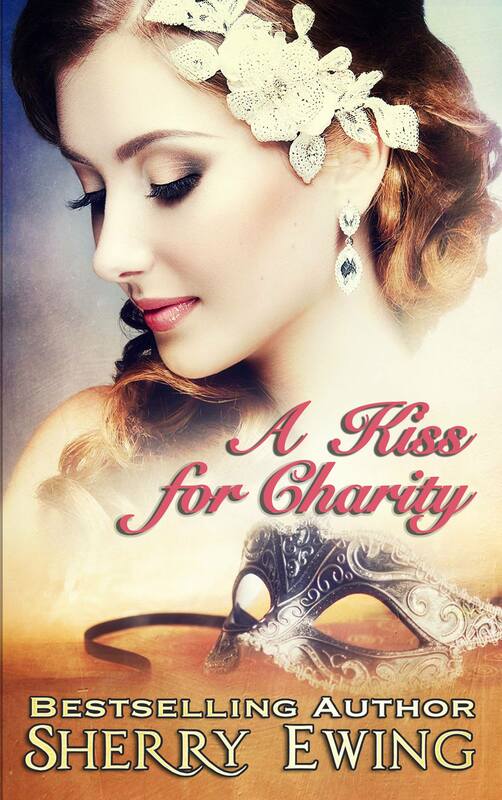 Katherine Wakefield has dreamed and written of her knight in shining armor all her life. Never finding a man to measure up to the one of her imagination, she and her three closest friends take a vacation to England. Yet strange things begin happening while visiting Bamburgh castle, but how could they have known they’d find themselves thrown back more than eight hundred years into the past? Katherine de Deveraux has it all or so she believes when she begins her life with her husband Riorden. But as she begins to settle into her duties as the Countess of Warkworth Castle, she finds that an easy life is not only difficult but downright dangerous to her well-being. 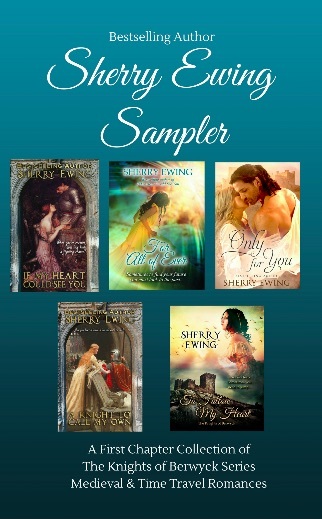 Bestselling author Sherry Ewing presents the continuing saga of the MacLaren’s in A Knight to Call My Own. When your heart is broken, is love still worth the risk? 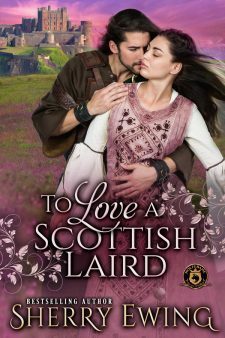 Lynet of clan MacLaren knows how it feels to love someone and not have that love returned. After waiting for six long years, she has given up hope of Ian’s return. Her brother-in-law, the Devil’s Dragon of Berwyck, is tired of waiting for her to choose a husband and has decided a competition for the right to wed Lynet is just the thing his willful charge needs to force her hand. Ian MacGillivray has returned to Berwyck Castle in search of a bride and who better than the young girl who cared for him all those years ago. But Lynet is anything but an easy conquest and he will need more than charm to win her hand in marriage. From the English borders to the Highlands of Scotland, the chase is on for who will claim the fair Lynet. The price paid will indeed be high to ensure her safety and even higher to win her love. 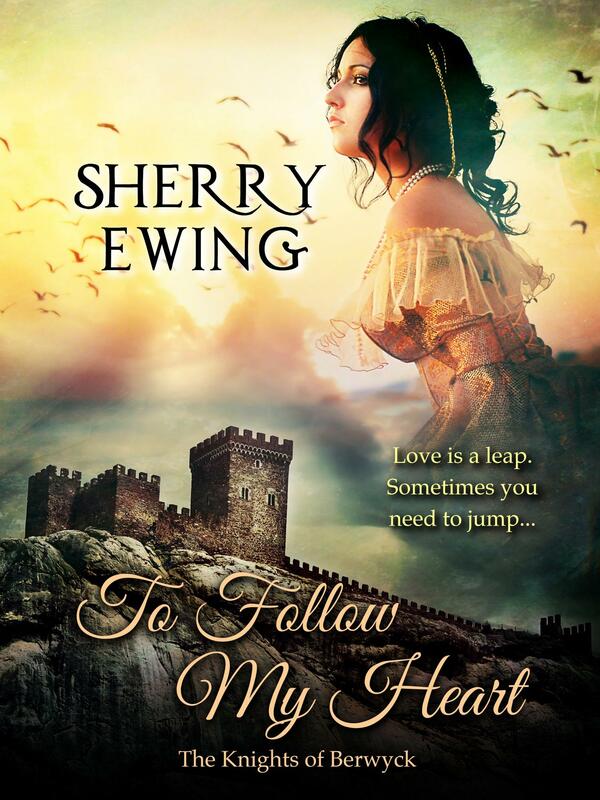 Bestselling author, Sherry Ewing, brings you the next installment of her Knights of Berwyck series, To Follow My Heart. 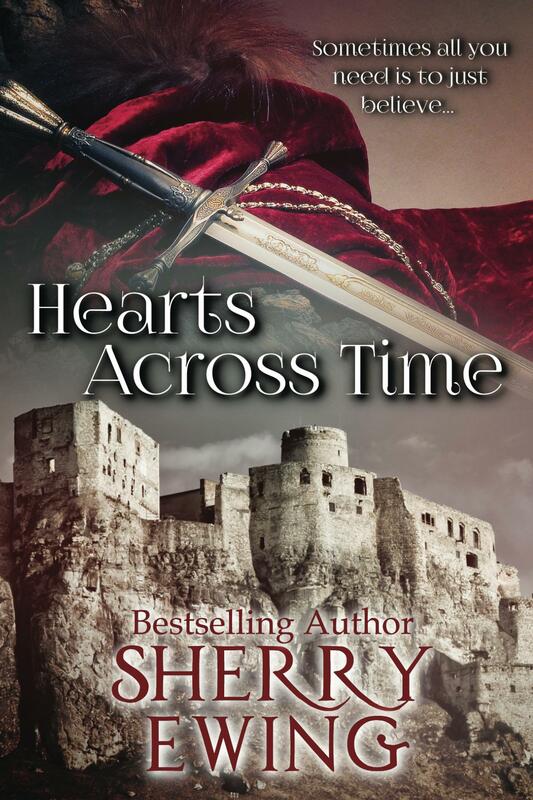 Bestselling author Sherry Ewing brings you this first chapter sample collection of her medieval and time travel series: The Knights of Berwyck. You can start reading her debut eBook, If My Heart Could See You, for free! But the MacLaren’s are only the beginning of the tales Ms. Ewing has in store for you as you get swept through time. Be prepared for hours of reading pleasure as you continue on with her Knights of Berwyck, A Quest Through Time series. You’re sure to have a book hangover in the morning. 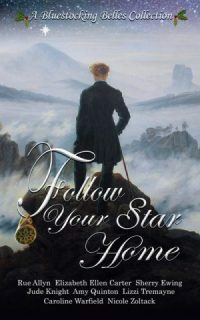 When Margaret Templeton is requested to act as hostess at Captain Sander Morledge’s Christmas party and possibly agree to marry him, she did not think she would see the man who once held her heart. Viscount Frederick Beacham had never forgotten the young woman he had fallen in love with, and his feelings are evident when he sees her at a holiday gathering. In a swirl of Christmas miracles and joyous celebration, will the two finally put down their differences and once again fall in love? When Lady Gwendolyn Marie Worthington is forced to marry a man old enough to be her father, she concludes love will never enter her life. Then she meets her brother’s business associate, and all those longings suddenly reappear. A long-term romance holds no appeal for Neville Quinn, Earl of Drayton until an unexpected encounter with the sister of the Duke of Hartford. Still, he resists giving his heart to another woman, especially one who belongs to another man. 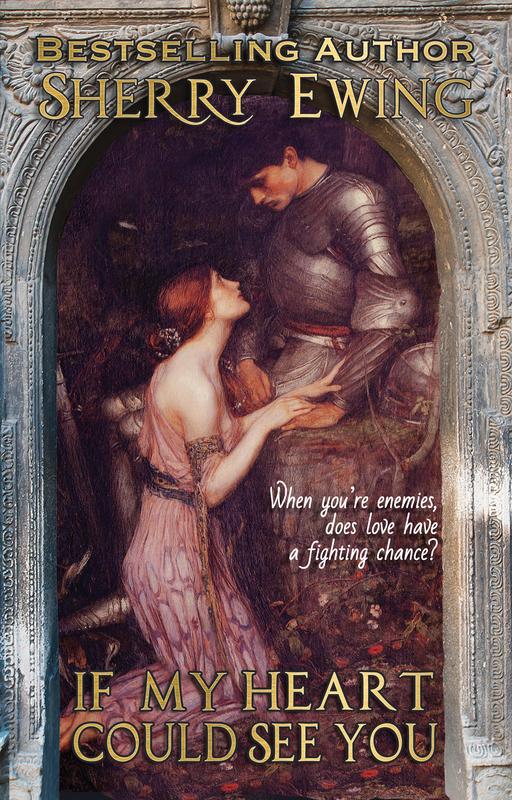 Chance encounters lead to intimate dinners, until Neville and Gwendolyn flee to Berwyck Castle hoping their fragile love will survive the vindictive reach of Gwendolyn’s husband. Before their journey is over, Gwendolyn will risk losing the only love she has ever known. 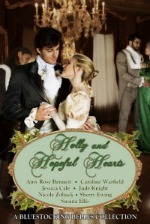 Holly and Hopeful Hearts is a Bluestocking Belles Collection available now. 25% of the sales benefit the Belles’ mutual charity the Malala Fund. 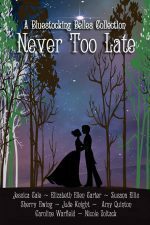 For the 2017 Holiday season, the Bluestocking Belles bring you Never Too Late. Eight authors and eight different takes on four dramatic elements selected by our readers—an older heroine, a wise man, a Bible, and a compromising situation that isn’t. 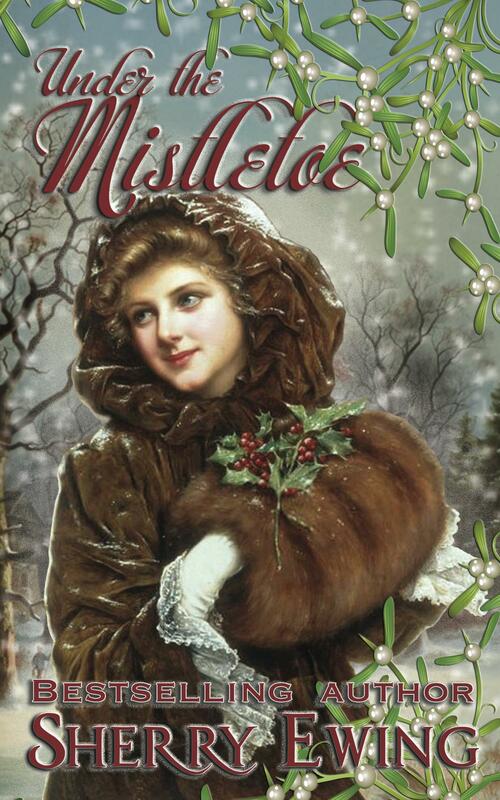 Set in a variety of locations around the world over eight centuries, welcome to the romance of the Bluestocking Belles’ 2017 Holiday Anthology. It’s Never Too Late to find love. 25% of the proceeds benefit our mutual charity the Malala Fund. 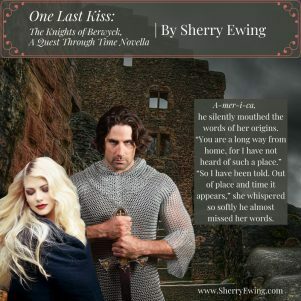 My contribution to the set is entitled One Last Kiss: The Knights of Berwyck, A Quest Through Time novella.